The OmniKine Human BD-4 ELISA is capable of recognizing both recombinant and naturally produced Human BD-4 proteins. The antigens listed below were tested at 50 ng/ml and did not exhibit significant cross reactivity or interference. Small volumes of BD-4 elisa kit vial(s) may occasionally become entrapped in the seal of the product vial during shipment and storage. If necessary, briefly centrifuge the vial on a tabletop centrifuge to dislodge any liquid in the container`s cap. Certain products may require to ship with dry ice and additional dry ice fee may apply. MBS9501831 is a ready-to-use microwell, strip plate ELISA (enzyme-linked immunosorbent assay) Kit for analyzing the presence of the BD-4, ELISA Kit target analytes in biological samples. The concentration gradients of the kit standards or positive controls render a theoretical kit detection range in biological research samples containing BD-4. The ELISA analytical biochemical technique of the MBS9501831 kit is based on BD-4 antibody-BD-4 antigen interactions (immunosorbency) and an HRP colorimetric detection system to detect BD-4 antigen targets in samples. The ELISA Kit is designed to detect native, not recombinant, BD-4. Appropriate sample types may include undiluted body fluids and/or tissue homogenates, secretions. Quality control assays assessing reproducibility identified the intra-assay CV (%) and inter-assay CV(%). 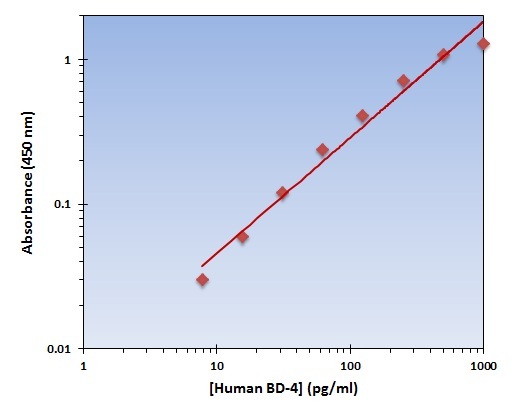 The OmniKine Human BD-4 ELISA Kit allows for the detection and quantification of endogenous levels of natural and/or recombinant Human BD-4 proteins within the range of 8-1000 pg/ml. NCBI/Uniprot data below describe general gene information for BD-4. It may not necessarily be applicable to this product. defensin, beta 4: Has antimicrobial activity. Synergistic effects with lysozyme and DEFB103. Belongs to the beta-defensin family. 1. Beta-defensin 104 displays antimicrobial activity against S. carnosus, E. coli, S. cerevisiae, and P. aeruginosa (strong).